Marilyn M. Sylla currently is a Five College Lecturer teaching at Smith College, Mt. Holyoke College, Amherst College and UMass Amherst. 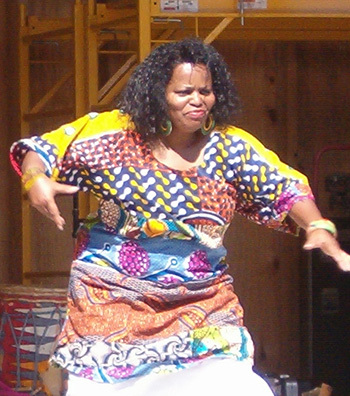 She has performed and taught in Brazil, Haiti, West Africa, including Guinea, Senegal, the Gambia and the Casamance and the United States. She has performed and taught at Jacob's Pillow, Omega Institute in New York, Kripalu Center, Rockefeller Center, California Technical Institute, at the Waldorf Astoria in New York City for the Latin American Music Awards and has also performed with folksinger Pete Seeger. She and her husband Sekou Sylla, former princpal dancer and acrobat with Les Ballets Africains, the National Dance Company of the Republic of Guinea direct the Bamidele Dancers & Drummers which presents workshops, concerts, residencies and arts & education lecture demonstrations. In 1990 the group performed in Boston for Nelson Mandela. Marilyn & the Bamidele Dancers & Drummers have released two CDs of African, Caribbean and Brazilian music, "Live" and "United." In addition, Marilyn and Sekou have released an African dance instructional video, "Wofa Baron" (Come Let's Dance).